If you step into my home on any given day, you will most likely not see perfectly clean floors and walls or even clean children half the time. My home is not a museum, it is a place of learning and growth! Sometimes that growth is not pretty! I dream of a perfectly organized, clean home with children who behave all of the time but evidently my children don’t dream that same dream:). If there’s one thing that stands out from my childhood it is that regardless of all the fighting and chaos that went on in a family with 8 kids, I always felt loved and at peace in our home. My mom never gave up making our home feel a little bit like heaven even though us kids probably made her life feel a little more like hell. 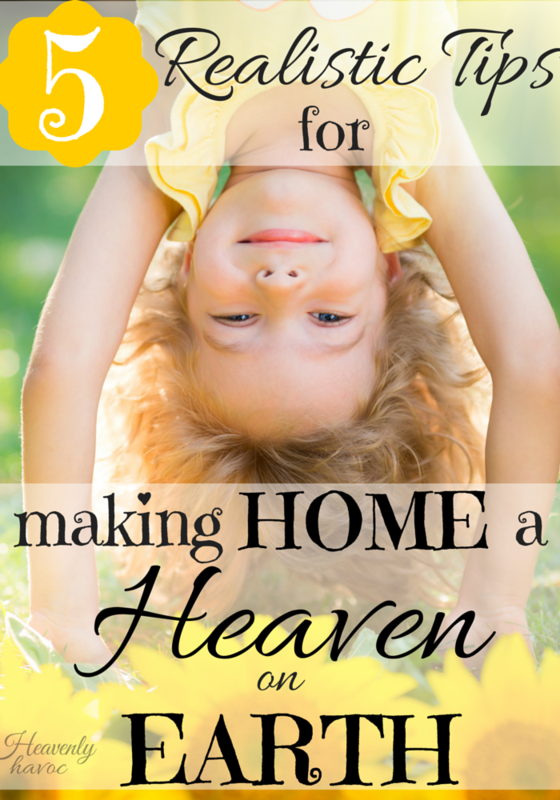 Here are five things I have learned for making home a heaven on earth even when hell seems to be knocking at the door! 1. NEVER give up! My mom taught me this and thank goodness she did or I might have given up a LONG TIME ago! When the going gets tough, take a break! Tell your spouse you need some time alone or just take your family and get out of the house for a while. Or you can do like I did this week. I got so tired of hollering at my kids to do their chores and help me. I finally figured it was better to take the “if you can’t beat ’em join em” philosophy rather than cause contention in my home. I hung up my apron, got off my pedestal and just spent time with the kids. Sometimes a home can be a mess, but if the kids feel loved, that’s what they will remember most! 2. Consistently LOVE! Regardless of the arguments I have with my kids, they know I love them. Fights and arguments are going to happen in close quarters with the ones we love, but always strive to make love your first priority! I have a 5-year-old that is good at reminding me of this. She is very stubborn and strong-willed and we tend to knock heads…A LOT! She always comes to me with arms stretched out for a hug, though, even if she’s still upset. I know that my weaknesses and mistakes could probably fill 20 thick volumes if written in a book, but I know God loves me regardless. I strive to do the same for my family. 3. Feed the PLANTS, not the WEEDS! It’s easy to see the weeds because they are so darn annoying! Why would we ever give them water? We want them to die, right? The same goes with seeing all the weaknesses in our family. If we constantly tell our kids what they are doing wrong, that’s what they will always think about. Instead, focus on the PLANTS. Who doesn’t love to have someone recognize all the good that they have within? As we feed the plants, they flourish and grow and the weeds become less noticeable! 4. Limit OUTSIDE INFLUENCES. I tell my kids that our family relationships are more important than anything else. If my kids are fighting with each other and the TV is on, then it goes off. If they can’t be nice to their siblings when a friend is over, then I tell them their friend needs to go home. If they are spending too much time on a device and not interacting with family, then the device goes in time out. I tell them the same thing my mom told me. “Your family relationships are eternal and matter far more important than anything else!” When influences outside our home get in the way of family, they get pulled…just like a big weed! 5. Spend time together! We have a specific night set aside just for family night. Sometimes it’s a short night and sometimes it’s longer but the most important thing is that it is consistent! Find a time that works for your family and don’t let ANYTHING get in the way. Invest the TIME into those who matter MOST! Making home a heaven on earth is more of a journey than it is a destination! When you look at a sunflower from a distance is looks bright and cheery and beautiful. Up close, though, it’s not so pretty when you compare it to, say, a rose! Yet, the great thing about sunflowers is that they can grow and survive in just about any conditions. They also follow the sun wherever it is in the sky! I believe the same of my family. We may not live in the best conditions and life can be rocky, but as long as we follow the example of our Savior, Jesus Christ, we will be blessed! With all the chaos and unrest in the world around us, what ways have YOU found for making home a heaven on earth?